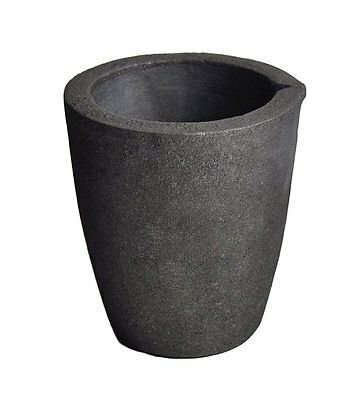 MegaCast Graphite Foundry Crucibles are made from a combination of graphite and clay, and are recommended for melting your precious, or non-precious metals and can handle large batches of material. Their thick inner walls can handle direct heat and open flame foundries. They can be used with our propane melting furnaces as well as a standard torch method. Rated to withstand temperatures up to1560°F - 2912°F - (850°C - 1600°C)..Not for use in a Coal Foundry,.Outside Dimensions - 4.75" Dia. x 5.25" Length - Inside Dimensions - 3.75" Dia. x 4.75" Depth **Heavy Duty Crucible Tongs Available in our Amazon Store**. Custom size crucibles are also available upon request! We always combine and reduce shipping on multiple purchases. Designed for Melting Gold, Silver, Copper, Brass, Aluminum and More! If you have any questions about this product by MegaCast, contact us by completing and submitting the form below. If you are looking for a specif part number, please include it with your message.